Microsoft Exchange data is composed of primarily emails, saved contacts, journals, scheduled calendars, notes, tasks etc. Exchange EDB database is crucial for major business enterprises; even a minor mistake leads to major data loss. At this point, extract data from Exchange 2010, 2007 and Exchange 2003 in live environment or in Offline mode using EDB Converter. That implies, any internal server fault or bug will result inaccessibility of Exchange Server EDB file (Mailboxes & Public folders) that must be fixed. What is the Need to Extract data from .EDB Exchange 2007, 2010 & 2003? The answer is: when Exchange server crashes or database fails to mount then it is not possible to read or access data stored inside EDB file. After exporting mailboxes in Outlook 2010, 2007 or 2003 editions, it is possible to access emails, contacts or calendars data from dismounted or orphaned database. What are Possible Methods to Extract Data from Exchange EDB File? First: Use Powershell commands, that are highly suitable commands to export Exchange sever mailboxes emails, contacts, calendars or other elements stored in EDB file. Second: Run EDB Extraction software that works in all extreme conditions. It gives more flexibility & ease of access for Exchange users to export data from dismounted or offline EDB file. How EDB Extraction Tool Solves the Problem to Extract Exchange Database? The valuable EDB Extractor software is projected towards troubleshooting the JetEngine errors which are encountered while accessing Exchange database. Meticulously recover damaged database fragments and export edb to pst file without any data loss. While extracting mailbox from exchange server, saves multi-level hierarchy of inbox, drafts, sent items, outbox, custom folders or subfolders correctly. Extract data from Exchange database by saving internal fields (to, cc, subject, bcc, from, attachments) of emails, calendars, contacts, journals, notes etc. No version dependency. Product is capable to extract data from .edb exchange 2007, 2010 and 2003 editions. Export single or multiple mailboxes at a time. Select to include desired folders and De-select to exclude particular folders or dumpster. None of the Exchange user or admin can afford to lose access of thier crucial data (for example: emails, journals, contacts, calendars etc). 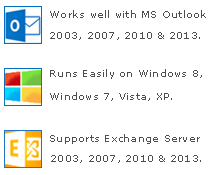 Here, EDB Extractor works like a charm even if Microsoft Exchange server is unavailable. Freeware edition of the tool has limitation to convert only 15 elements per mailbox. In order to break the limitation, user must invest over full version for completely exporting database from MS Exchange to Outlook 2010 to 2000 ver.